Send some chocolate joy with this decadent assortment of perennial favorites like double dipped caramel pretzel rods with chocolate and nut toppings, chocolate toffee, chocolate caramel pecan clusters, dark chocolate almond bark, chocolate non pareil drops, a giant peanut butter cup and chocolate covered OREOs, grahams, and pretzels. 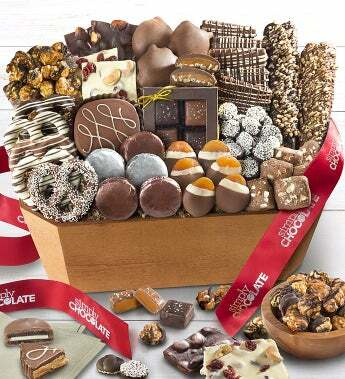 Beautifully arranged in a natural wood basket and tied with a signature Simply Chocolate logo ribbon. Perfect for good friends, family or business associates! Gift measures 14.5" x 9" x 7"
Send some chocolate joy with this decadent assortment of perennial favorites like double dipped caramel pretzel rods with chocolate and nut toppings, chocolate toffee, chocolate caramel pecan clusters, dark chocolate almond bark, chocolate non pareil drops, a giant peanut butter cup and chocolate covered OREOs, grahams, and pretzels.